I know the announcement of a Holiday Neiman Marcus and Target capsule collection is old news. But just a few weeks ago the sneak peaks of what will be for sale hit the interwebs (or your morning news shows). Given my work load the past few months, somethings I'm just a touch behind on. But yesterday through the magic of the internet I was reminded. And boy was I forever happy!!! This collection is so fun! Some of the pieces don't interest me personally but some do! And all are so fun! Here are some of my favorites. These were a few of the items that stuck out to me! Although I could totally see myself with the Carolina Herra stationary or the Phillip Lim skateboard. I think 2, 4 & 5 are my favorites! I updated my iPhone reminder, I had it set for the wrong day! Now lets see if I get up in time to hit the store early.....I am avoiding the 'net after the whole Missoni crash-la-webpage-nonsense. :) Did anyone else find anything they may want to pick up? Did anyone get anything from the Nate Berkus collection - that hit stores this past Sunday?! I saw a gold vase, but had no place for it. So I passed. thanks for reminding me how inconvenient target is for me. Look, do you want anything? I can get it for you and paypal $ and then they are yours! I say me you and Lara do a 6am roadtrip to Target in Logan Square - ya?! I'm so excited! I love those pretty glasses. OMg those Altuzurra old fashion glasses?!?! I need them in my life! I wish there was a Target close to me in NYC! Let me know, you can pay pal me and I can get them for you! Seriously! i'm often disappointed in the quality of the clothing for the designer collaborations but the home goods are always awesome! you picked some of my favorites! 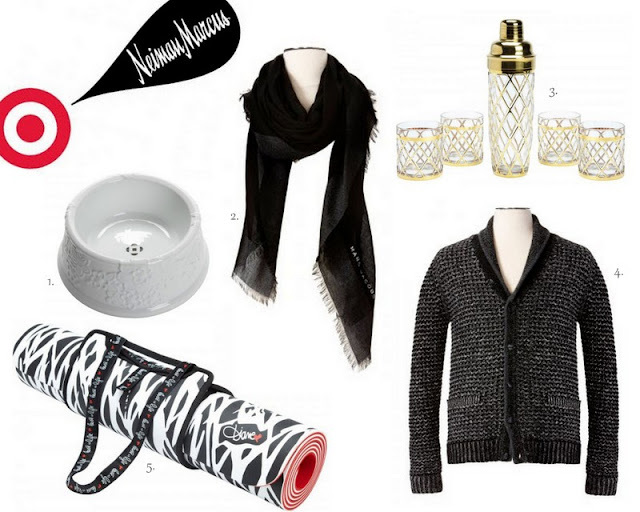 the MJ scarf and rag & bone sweater and the yoga mat! i haven't gotten to see anything in person yet but fingers crossed for them! I love the Carolina Herrera stationery and the Marc Jacobs pouches! So excited for this to come out! Can't wait for my doggy's to have the OdlR bowls! SO excited for this NM collab!! I love the yoga mat and am headed over to look at the rest. I just got such a bad taste in my mouth from the Missoni that I hesitate to get attached to anything in any of these collaborations.